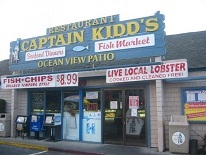 Captain Kidd’s Redondo Beach is not located on the Redondo Pier but is adjacent as it sits in King Harbor. The restaurant is also a seafood shop but offers plenty of selections for dining out on the patio. Crabs are a big hit at Captain Kidd’s as you can select them, they steam them, and provide you with a mallet to help you eat! Mahi Mahi (Fiji)- Charbroiled or sautéed sweet, mild flavor similar to swordfish, lean, firm, pinkish to off-white flesh. Oysters- Lean and most, sweetly mild but distinctive flavor. Yellowtail (San Diego)- Charbroiled flavor and texture similar to tuna, firm and moist. Tilapia (San Diego)- Charbroiled or sautéed light like Sole, mild and sweet. Ice Cod (Alaska)- Sautéed or deep fried, mild clean flavor with white lean meat. Large tender flakes. Ling Cod- Mild, clean flavor with white lean meat. Large tender flakes. Salmon (Farm)- Charbroiled lean mild flavor, low in oil, small flaked. Calamari Steak (Mexico)- Sautéed or deep-fried, firm, chewy texture and mild somewhat sweet flavor. Catfish (Louisiana)- Charbroiled, sautéed or deep-fried, moist, dense, firm meat, white to off-shite, sometimes pinkish. Albacore/ Tuna (Fiji)- Charbroiled or sautéed, mild rich taste and a firm steak-like texture, large moist flakes. Sea Bass (Chilean)- Charbroiled or sautéed, oily, tender, moist snow-white meat with rich flavor, thick flakes. Wahoo (Fiji)- Charbroiled or sautéed moderate fat flesh is fine, white, little red and slightly sweet. Sea Bass (Mexican)- Charbroiled, sautéed or deep-fried, mild, delicate, sweet flavor, translucent white with pinkish flesh. Orange Roughy New Zealand)- Sautéed or deep-fried, mild, delicate moist flavor, pearly white flesh, white flakes. Tuna (Hawaii)- Seared, charbroiled or sautéed mild meaty flavor. Halibut Steak (California)- Charbroiled or sautéed, sweet tasting, dense white, fine grained meat, flaky when cooked. Halibut Steak (California)- Sautéed or deep-fried mild, sweet tasting, dense white, fine grained meat, flaky when cooked. Opah (Fiji) Charbroiled or sautéed also known as moonfish, pinkish flesh with a rich full flavored fine texture. Swordfish (California, Hawaii, Australia)- Charbroiled moist and flavorful with a slight sweet taste, lending to a firm meaty texture. Fish ‘n Chips- includes 1 side dish and 2 pieces of deep fried boneless whitefish and French fries. Blackstone Chardonnay- Medium bodies with floral and fruit flavors. Blackstone Sauvignon Blanc- Medium bodies with a nice grapefruit finish. Burlwood Cabernet Sauvignon- Full bodies, red cherry, chocolate with nice tannins. Burlwood Merlot- Ripe blackberry aromas, hints of vanilla, rich fruit flavors. Dry Creek Chenin Blanc- Lingering flavors and clean berry finish. Estancia Chardonnay- Tropical fruit flavors, soft creamy finish. J. Lohr Riesling- Aromas of apricot, pear, apple, nice and crisp. Lagaria Pinot Grigio- Light bodied, ripe citrus aromas with crisp lingering finish. L’orval Merlot- Ripe blackberry aromas, hints of vanilla, rich fruit flavors. Raymond Chardonnay- Medium bodied with a kiss of vanilla. Smoking Loon Chardonnay- Light bodied, crisp, ripe Chardonnay fruit with a dry finish. Trinity Oaks Pinto Grigio- Light bodied, ripe citrus aromas with crisp lingering finish.